Weight loss, it’s a thing. Aside from rigorously following Slimming World for eight months, people ask me how I lost 3.5 stone (three of which I tell myself were each of the BUBs’ fault, half a stone was the biscuits’ fault, but it’s probably the other way round). 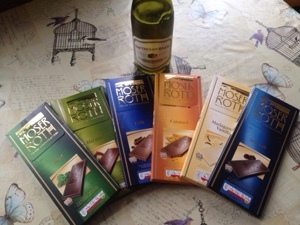 Individually-wrapped Moser Roth chocolate bars from Aldi. To be precise, and you do need to be, five 25 gram bars per packet, in a myriad of flavours. And Sauvignon Blanc. Measured into 125ml or 175ml glasses. Preferably this bottle from Aldi, or Brancott Estate or whatever I could lay my hands on. For me, it was most nights for the chocolate. If I wasn’t having wine then I could sometimes have two chocolate bars, depending on what else I’d had that day. It was my ‘thing’. You need to have your ‘thing’. Fortunately my ‘thing’ was also all the stuff you can have and indeed much of which there are no limits on: beans, potatoes, noodles, cous cous, fat-free dairy products, pasta, lean meat and fish, chicken, vegetables, fruit, rice, a sprinkle of cheese. MARMITE. Think every meal you’ve ever cooked, but loaded with more vegetables and cooked in less fat or oil. That’s dinner sorted. There’s no tedious calorie counting and minimal weighing, just cheese, nuts, cereal and bread for me, which you’re allowed a little of each day. Fair enough. I ate huge plates of food when I was hungry and went back for more if I wanted. The secret to not wanting all the 25g bars of chocolate in the packet is to make sure that you’re not hungry. Ever. It’s that easy. Keep eating the right stuff all day. Pile it high. And that’s why diets that leave you hungry will never work. The chocolate (or whatever your ‘thing’ is) will always win. And, sometimes the chocolate DOES win, even when you’re stuffed to the gills. The wine definitely has a knack of winning. That’s life, and the trick then is to just carry on the next day as if nothing has happened. It can be your dirty little secret. It’s good to have those once in a while. Next postGroup B Strep – wassat? Ooh I never tried the frozen chocolate thing. What’s the deal? Does the chocolate last longer? Does it melt as you eat it? I don’t really like refrigerated chocolate so not sure if I’d like it. Hmmm. There are so many reports about what to eat, not what to eat, drink this, etc… at the end of the day make sure you eat your fruit and veg and eat things in moderation.